It was a curious Thursday for television news — viewers may have experienced déjà vu as most channels continued where they had left off Wednesday — that is with the debris of Pakistan’s F-16 fighter jet, downed the previous day. Times Now still warned viewers not to “become a victim of Pakistan’s fakery”. Visuals of an engine, parts of an aircraft were on display like trophies as proof of the F-16’s crash (Zee News). News X paraded “exclusive” footage of `wreckage’ of the plane — “Pak hiding wreckage,” it claimed. After US President Donald Trump set the stage for conciliatory moves by Pakistan, at his press conference in Hanoi saying he had “attractive news”, Pakistan PM Imran Khan announced the return of the MIG-21 pilot, Abhinandan Varthaman as “a peace gesture”. TV news saw it as a triumph of India’s unrelenting position: “Victory” proclaimed CNN News 18. Pakistan “cracks under pressure”, added Times Now. This set the stage for the prime time debates which were basically all about “Escalation vs. De-escalation”. While Republic TV’s Arnab Goswami wanted “escalation”, NDTV’s Ravish Kumar thanked “all those who wants that war should not take place”. India Today anchor Shiv Aroor asked Retd Air Vice-Marshal Arjun Subramanian why Pakistan was returning Wing Commander Abhinandan to India. What will the government do next, Aroor asked BJP spokesperson Syed Zafar Islam. On RepublicTV, Goswami said India shouldn’t de-escalate; instead it should go for a “#final strike”. 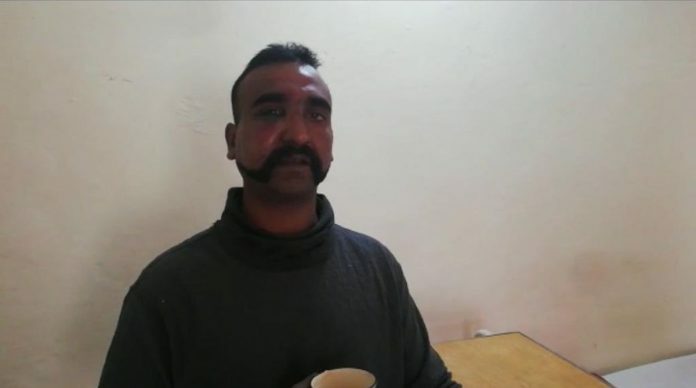 “Release and relief” sighs The Indian Express this morning, welcoming Wing Commander Abhinandan Varthaman’s return to India Friday from Pakistan. It calls this among the “first signs of de-escalation of tensions between India and Pakistan”. The Indian media sees the homecoming as a victory for India’s successful hard-nosed approach — it dismisses the release as a “peace gesture” as Pakistan’s prime minister called it. The Times of India writes in “Abhi Coming Home, India Won’t Budge On Terror”, “The Indian side remained unconvinced about Khan’s sincerity, pointing out that his ‘peace gesture’ was not voluntary but was prompted by international pressure”. The Telegraph chooses to focus on a detail that other papers bury: “‘Premature’ tag on number of deaths” reads its headline. This is an aspect international media — from Al Jazeera to Reuters — has focused on, too. Telegraph says 325 terrorists reportedly killed in India’s airstrikes is an arbitrary number as long as there’s no evidence to back it up. It quotes Air Vice-Marshal R.G.K. Kapoor from Thursday’s press conference who declined to put a number on those killed because “it will be premature to say”. “The confusion can be cleared if the Indian political leadership takes a cue from the air vice-marshal and releases the evidence,” says the newspaper. There’s great confusion on the latest GDP figures The December quarter of 2018-19 now stands at a growth rate of 6.6 per cent—the lowest in six quarters, say Hindu, Express and Business Standard. HT, TOI and Economic Times say it’s a five-quarter low. Oddly for a business paper, ET carries the report in the bottom right hand corner of Page 1. Hindi dailies are also looking forward to the return of the IAF pilot. Amar Ujala sees this as a diplomatic win for India and Pakistan’s isolation in the international community. Ujala claims Pakistan tried to negotiate through the day before Imran Khan’s announcement. Dainik Bhaskar’s editorial says “Yeh badle huey bharat ke liye duniya ka abhinandan hai” (A changing India is welcomed by the world). The speed at which he is being returned and Pakistan’s inability to extract any concession from India, indicates a diplomatic win for India. Jagran says the release of Abhinandan is also an image making exercise for Paksitan. Pakistan wants to free itself of international pressure building up from US, France and others. Editorials in TOI, HT, Express and Hindu welcome the return of Varthaman as an opportunity to “de-escalate” tensions, while two comment pieces warn of the way ahead. In Hindu’s “Living on the edge”, Jawaharlal Nehru University’s Happymon Jacob wonders how de-escalation can be achieved between India and Pakistan “without either losing face”. The piece was written before Varthaman’s release was announced, is relevant nevertheless for he argues that in the current stand-off, “India did not gain any military advantage over Pakistan…making it difficult to claim victory”. And, “BJP needs a victory” he writes, which Pakistan “will not give without a war of attrition.” Jacob suggests the best way to de-escalate without a loss of face for either side, is to “open back channel negotiations” as was done during the Kargil conflict. In HT’s “Stop reducing war to a spectacle”, senior journalist Rajdeep Sardesai, who anchors TV news and debates on India Today, warns against a “jingoistic television media rooting for war”. “…anyone who questions the government… is branded an anti-national” he writes, and cites how Sunil Gavaskar and Sachin Tendulkar are “being questioned” because they don’t “endorse” a boycott of Pakistan at the forthcoming World Cup. Sardesai recalls a previous BJP attempt to equate the party with “the credo of Hindu nationalism” in 2002 Gujarat after the communal riots. The BJP won the subsequent state elections, spectacularly. Now, too, a “scary narrative…” of a nation “at risk from internal and external enemies” is being created, he writes. While “war gaming” raises Television Rating Points, “a responsible government cannot take a war for votes approach to national security”, he writes. What we as citizens expect is an unbiased view from media, but unfortunately news medium Like yours is always anti bjp and sometimes in the event if taking anti modi stand you eventually take anti people and pro Pakistan stand. You always fail as the fourth pillar of democracy. I think we should laugh on all the comments given above. Man there are more responsible people who know what to do and how to do they don’t want your opinion. Keep a little faith in the government and the armed forces. No one wants war with Pakistan. We are not against Pakistan, our war is against terrorism. Modi government should not take any credits for the work IAF has done. Knowing what will be the consequence of such bold decision at international level. Modi government has done just every government could have done. It is a request that please don’t compare the air strike against terrorism with the election it is a very wrong perspective. Can we really afford a war . The international media addresses kashmir as India administered Kashmir and Pakistan administered Kashmir. So for both the countries have failed to convince the international community that Kashmir is their jugular vein and are fighting for decades to claim the mainland of J and K putting the life of millions in danger and draining billions in financing to keep the claim alive. Both the nations can’t afford to wage a war against each other where a majority of population is living under poverty line. Indian media is the most corrupt institution in the world. Spewing poison in society for the interest of their patrons. people know the truth but only surf channels to find how low they can go. Actually prostitutes are far more respected and more responsible to their profession than Indian media people. It appears at least RSS and Bjp is successful in poisoning , and polarising the society ,by Communalisation on Hindus and Minorities paralelly India Vs Pakistan in particular and all neighbors in general, Only one job done by fascist forces. Once society drinking such venom , it’s obvious they are 100 % blind and lost all logical quantity. Stooge and sycophant is immaterial to facts and logics can easily be construed so all false propagandas have eaten them, so truth and fact give those people of slaves origin a bitter pinch . All such war mongers must have sizeable share of Massive black money amassed by their Political fathers so a devastating war doesn’t impact . 6.6% GDP will soon becomes 8.2 % that’s the speciality of modi govt. In this whole game of one-upmanship the media totally forgot about six unfortunate souls who lost their lives in service of the nation at Budgam in helicopter accident. These are the same people who are the work horses during peace (more in peace) and war alike. None covered their martyrdom probably in the circumferences it was more appropriate for them to extract TRP multiplier news, others can wait, Apathetic attitude. People talking about de-escalation is sheer nonsense having no knowledge on Pakistan nefarious design. Pakistan ISI is cheat and dangerous. It has adopted terror a part of its policy to ward India. Ravishkumar has urged viewers not to watch TV for next 2&1/2 months. So much for his love for freedom of expression, democracy, award-vapsi, tukde-tukde gang & “blackout episodes”. Better try and improve your & channels Viewability. Ravishkumar who was till now championing cause of democracy, freedom of expression, intolerance, award-vapsi & tukde tukde gang, suddenly urging viewers to stop watching tv for next 2&1/2 months. He realises his & NDTV TRP has reached rock bottom & best way after his “black-out” episode is to urge viewers to blackout all other channels. Professionalism matters.Great.job.Have stopped watching Indian TV channels. They remind of the embedded reporting by US media during the Gulf Wars. I guess you must be watching Pakistani TV channels……. I appreciate how NDTV India maintained all the aspects and ideals of the journalism in these hard days. Meanwhile, some mainstream media channels were just trying to create a seudo environment that there is war going to be between India and Pakistan. Whereas, Ravish Kumar did his prime time in a sensible and mature way. He looked upon the consequences of war. There were few news youtubers who were regularly exposing politics behind the scenes. Thanks to some great youtubers that just reduces the anger by adding credible news through the videos. Leftist papers have like The Hindu ,NDTV has made India n a sleeping giant who doesn’t react to chote note terrorists attacks like Pulwama….coz it’s not their brothers/husband/ sons ,who have lost lives..for the first time of our collective consciousness has awakened and we as a nation want this to end once for all.They would call it war mongering. …question our govt.Ji want to ask the conniving, treacherous people in these channels…what do they want?? Our enemy’s stated goal is to bleed India with thousand cuts to achieve their jihadi agenda.But these leeches wants talks.? When an enemy bleed u ,u get ready for final assault and doesn’t prepare for talks..I think we as a nation t ready for this final assault…. And will not let our brave boys to martyred daily., anymore.Its the people like you who has to make a choice …. I’m not watching other news channels instead of Ndtv, quint and the print your YouTube channel. So I am happy that War situations becoming de-escalate, and same Ravish Sir said in prime time. We are happy to get our pilot back. War will only do destruction. Diplomacy is better than war. Fair or biased? can’t rely on indian TV news channels, why can’t they be like BBC. Duty of citizen in this nation and probably in this today’s advanced modern information age is not being pro towards any ideology but being just a aware about what information he is conceiving every moment. It is fact that India has only 2 national parties and it seems to remain that way atleast untill next few decades. We have to force both of them to be pro citizen and let go away politics which serves near to nothing. Mother sellers like Congress and NDTV don’t matter. They will trade their young wives for monetary gains. I can only say that we hardly get news these days. Its only opinions that we are fed , day in and day out. It’s competitive journalism and each feels he is a better journalist than the other. All they are vying for is trp and some award which says they are the best. They simply go hyper for no reason at all. The debates,the news, and ever act on tv is sheer noise. Stop your nonsense once for all. You are all well fed & bribed by cash envelopes you have taken by 10 years UPA govt & NDTV is not an angel which is indulging in fera rule violations & anti BJP channel. They enjoyed all their misdeeds during Congress rule by keeping mum on moutain hell of various UPA scams when other news channels were unearthing scam after scam everyday. You are anti India & anti BJP with left ideology. Shame on you. It’s people like shekhar gupta talks about peace knowing still peace is only for short term. I really don’t know what Imran Khan means by Peace. Or what peace are these TV channels telling us. When Vajpayee and the then PM of Pakistan opted for peace Kargil happened. It’s clear that Pakistan cannot win against India. They can only work through terrorists and harass India. Time to time the story of de escalation comes up because of nuclear capabilities. Clearly if nuclear war occurs Pakistan will stop to exist and India will be badly damaged. So there will never be peace from Pakistan side. Imran Khans gesture of goodwill was forced down on Pak by the world. If peace was their design they would not have stepped up firing at the LoC.